Studio GlassHopper. Specialists in intricate and modern design in stained glass techniques like “Prairie School” of Frank LIoyd Wright, Art Nouveau, Deco and abstract design. Since 2009 Studio GlassHopper has also started offering hot glass creations in the form of glass blowing, kiln casting and pate de verre. The studio is constantly innovating and seeking to develop new concepts in design and their implementation in different glass techniques. And soon, you will see interesting results from our experiments with hot and warm glass for installations and architectural use. Of course, the hallmark of all our projects is design and craftsmanship of impeccable quality. At Studio GlassHopper, we encourage clients to participate in the designing process to understand their vision and transform their ideas into exquisite glass pieces that stand the test of time. Each project emerges out of a participative creative process, from design conceptualization to glass selection to final fabrication at the work site. 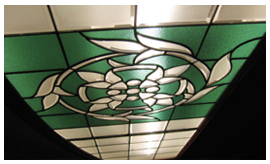 The studio has the capability to develop and create aesthetically appealing and original designs, customized as per client requirements at the site for both stained and other three-dimensional art glass. We also execute volume-based export orders. 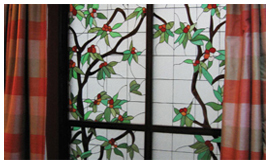 The Studio’s competitive strength in the world market is two-fold: One, the huge glass industry in India; two, highly competent artists and artisans to deliver on international requirements of high quality hand crafted items in stained and leaded glass. The two combine to deliver fabulous creations in a very cost-effective manner. A kaleidoscope of light shimmering through the Cathedral window…that’s what held a little girl in awe and motivated her to build her career around ‘colourful glass’. Nandini began her career as a glass artist in 2000. 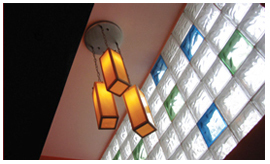 Soon she founded Studio GlassHopper where she began experimenting with lampshades, creating refreshing original designs in the traditional “Tiffany” styles. In no time, she diversified into creating products like flat glass panels for entrances, windows et al. Under Nandini, the studio works with various architectural and interior design firms and has executed a large number of commercial installations. The prime mover and founder of the studio, Nandini handles all phases of design development personally, from conceptualization to fabrication and installation. All of this is done with a keen eye on client requirement at the architectural site as well as the budgets. To hone and diversify her skills further, in 2008, Nandini visited CDGRI, Firozabad, India, to learn and experiment with the technique of hotglass. But not satisfied with the experience, she wanted to fully realize her dreams as an artist and scale new peaks in her field. Therefore, she decided to learn the art of blow glass and make her own designs in different blowing techniques, impossible to learn in India. Hence, she looked beyond and “Riksglasskolan – Orrefors”, one of the leading institutes in the world in studio blowing in Sweden, was her next step. kiln-casting, patte de verre, sand-casting and engraving at the cold shop. 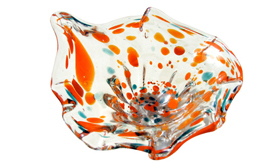 She also went to Danmarks Designsckole, Copenhagen 2009 to further experiment with glass designing and blowing. Nandini loves to create one of a kind handcrafted blown forms in rondels, vases and bowls. Her intent is to mix hot glass techniques and work with her Scandinavian glass making techniques in glassblowing, kiln-casting, sand-casting and pate de verre and create a variety of designs for architectural and sculptural glass. “Imagination” is what fuels our mind. It is here that our journey begins, taking into account the client’s vision. This leads to conceptualization and design that culminates in the creation of our master-piece. Truly a product of passion, love and zeal. Our design philosophy is ‘Less is more’. We believe in simple and minimalist design, of impeccable quality that aims to stand the test of time and brings delight to all customers and connoisseurs of art, alike.